A 22-year-old student from Perth, Australia, has posted a shocking video of a narrow escape. Christopher Jones had a seizure while skydiving, but luckily was saved mid-air by his instructor. The whole incident was captured on a helmet-mounted camera, and the footage went viral on YouTube with almost 3.5 million views in a day. The jump was from 12,000 feet (3,600 meters), and the seizure occurred at 9,000 feet (2,700 meters). For the next 30 seconds, Jones was in free fall, according to the video description. In the footage, Western Australia Skydiving Academy instructor Sheldon McFarlane manages to get to the unconscious Christopher and pull his rip cord just in time, at 3,000 feet (900 meters) above the ground. Jones has epilepsy but said he hadn't had a seizure in four years. "I've always wanted to have the feeling of flight, so I just thought, considering I can't fly a plane due to my condition, I thought I'd give it a go,” he told the Australian Broadcasting Corporation. Western Australia Skydiving Academy business manager and chief instructor Robin O'Neill said the course participants fill out a questionnaire whether they had illnesses and conditions such as epilepsy. "His treatment specialist wrote a letter specifically saying he was fit for skydiving," O'Neill was cited as saying. Jones said he believes that he would have been fine even if the jumpmaster hadn’t pulled his ripcord. "I think I'm fairly lucky, but the emergencies [automatic activation devices] on the chutes work nearly all the time so I think I would have been OK if the jumpmaster hadn't actually caught me." 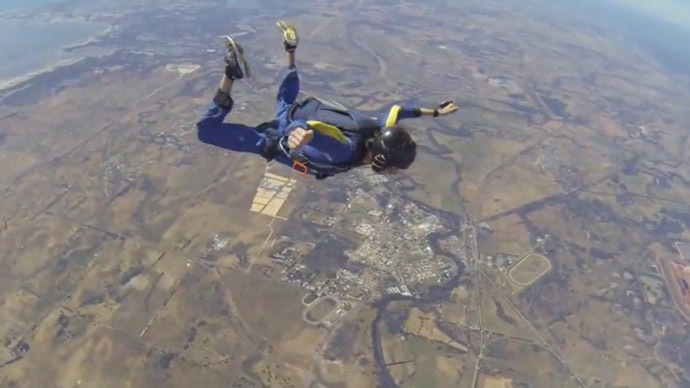 The jump took place back in November, but the student only posted the footage over the weekend. “It’s a bit overwhelming, I didn’t expect anything like this,” Jones said.